Oregon State Bar’s CAPITOL INSIDER. The archives are still available here. What’s New with the OJD /eCourt? On May 23, members of the Bar traveled from all over the state to participate in the Bar’s Day at the Capitol. Fifty Bar members took time out of their schedules to meet with 23 legislators throughout the day to discuss the Bar’s legislative priorities: funding for the court system, legal aid, and indigent defense, and the Bar’s law improvement proposals. Over the lunch hour, legislators, as well as representatives from the Oregon Judicial Department, Public Defense Services Commission, and legal aid, discussed the challenges the judicial system is facing. Justices Martha Walters and David Brewer, introduced by Senate President Peter Courtney, focused on the need to fund Oregon eCourt and the state’s courthouses, and on ensuring that the court system stays at the current funding level. John Potter, vice chair of the Public Defense Services Commission, discussed the need for pay parity between public defenders and deputy district attorneys and the need for consistent and stable funding, while Amy Edwards, president of the Oregon Law Center board, spoke about the importance of funding legal aid services in Oregon. In addition, Senator Floyd Prozanski and Representatives Phil Barnhart, Duane Stark, Karin Power and Richard Vial all discussed the importance of stable funding for the judicial system. Thank you to our speakers, legislators, and to each of the volunteers who traveled to Salem to share the Bar’s support of judicial funding with legislators. The Joint Ways and Means Committee reviews and votes on legislation that needs state funding as well as the budgets of state agencies, boards, commissions, the judicial branch, and the legislative branch. Including the agency budget bills, there are approximately 400 bills assigned to the committee. Below are some of the bills the Bar is tracking. A full list of measures assigned to the Ways and Means Committee is posted here. HB 2171 – Requires the Oregon Volunteers Commission for Voluntary Action and Service to maintain a volunteer staff of court appointed special advocates sufficient to meet the statutory requirement to appoint a court appointed special advocate in every juvenile dependency proceeding. HB 2356 – Establishes requirements under which a debt buyer may bring legal action to collect a debt. HB 2561 – Directs the Public Defense Services Commission to adopt policies providing for compensation of appointed counsel at a rate commensurate with compensation of the equivalent position within the office of the district attorney. HB 2605 – Increases the number of circuit court judges in several judicial districts. HB 2636 – Modifies annual salaries of judges of the Supreme Court, Court of Appeals, Oregon Tax Court, and circuit courts. HB 2795 – Increases certain filing fees, motion fees, settlement conference fees, trial fees, fees for writs of garnishment, and marriage solemnization fees. HB 2797 – Increases the presumptive fine for violations, including traffic violations occurring in certain locations. HB 5013 – Appropriates moneys from the General Fund to the Judicial Department for biennial expenses. HB 5033 – Appropriates moneys from the General Fund to the Public Defense Services Commission for certain biennial expenses. SB 11 – Modifies annual salaries of judges of the Supreme Court, Court of Appeals, Oregon Tax Court, and circuit courts. SB 106 – Creates the Public Records Advocate and Public Records Advisory Council. SB 503 – Directs the Chief Justice of the Supreme Court to establish uniform visitor policies. SB 5535 – Appropriates moneys from the General Fund to the Department of Revenue for biennial expenses. This year both the Senate and the House have developed legislation to modify the corporate taxation system in Oregon. Both proposals would move away from the current corporate income tax and replace the tax with a corporate activities tax. The proposal from the House, championed by House Speaker Tina Kotek, Representative Nancy Nathanson, and Representative Phil Barnhart, is called the Oregon Education Investment Initiative. Like the Senate proposal, the House proposal would eliminate the corporate income tax. In its place would be a 0.95 percent corporate activities tax on Oregon sales above $5 million. The proposal also includes personal income tax reductions to low- and middle-income households, which have not yet been finalized. The proposal from the Senate, championed by Senator Mark Hass, would also eliminate the corporate income tax. In its place would also be a corporate activities tax on all businesses. Those businesses with annual gross receipts of less than $150,000 would not be required to file a corporate activities tax return. Businesses with gross receipts greater than $150,000 but less than $1 million would be required to file a return and pay a $250 flat amount. Those businesses with annual Oregon gross receipts greater than $1 million would be subject to a corporate activities tax equal to $250 plus an undetermined percentage of gross receipts greater than $1 million. The circuit court eFiling system (OJD eFiling) now accepts electronic checks (eCheck) as a payment method. You can setup an eCheck payment account through your OJD eFiling account. Using eCheck will help keep costs down and limit future increases in filing fees. The Oregon Judicial Department now offers interview-based forms (iForms) to file and respond to dissolution, separation, and child support/custody cases. A new parenting plan iForm is also available. These forms help self-represented litigants ensure that complete and legible information is provided in their cases. For more information go to http://www.courts.oregon.gov/OJD/OnlineServices/iForms/Pages/index.aspx. New website incoming! The Oregon Judicial Department is redesigning its website to be mobile friendly, have a consistent appearance, and be easier to navigate. More information coming soon. June 2, 2017, is the second major deadline in the Oregon Legislature’s 2017 session. All bills currently in policy committees must have moved out of the committee in the second chamber by the end of the day on June 2. Bills that have not moved out of committee and to the floor, or to Rules, Revenue, a joint committee, or the Ways and Means Committee will be dead. Before the beginning of the session, House and Senate leadership identified June 23 as their goal for completing the legislative session. The constitutional close of session is July 10. As of May 31, 2017, the Senate requires, at a minimum, one-hour notice prior to a committee meeting. While the expectation is 24 hours notice, one hour notice is available with the Senate President’s approval. 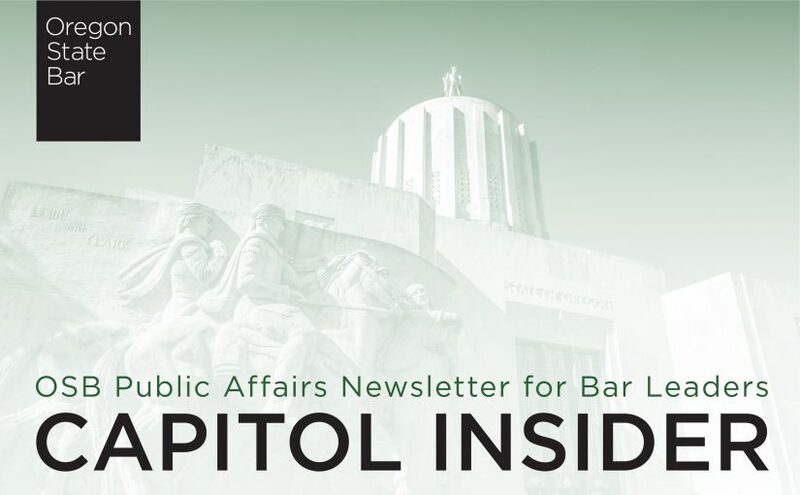 Thank you for reading the Oregon State Bar’s CAPITOL INSIDER. We hope you enjoy our new format. The archives are still available here. Please join the Oregon State Bar for the biannual Day at the Capitol on May 23, 2017. This is an opportunity to meet your legislators; advocate for court funding, indigent defense, and civil legal services; and develop an in-depth understanding of the legislative process. There will be a program at noon with remarks by Justice Martha Walters and Justice David Brewer from the Oregon Supreme Court, John Potter from the Public Defense Services Commission, and Amy Edwards from Legal Aid. Lunch will be provided to those who RSVP. If you are interested in participating, please contact the Public Affairs Department at [email protected] to RSVP. On April 24th and 25th, the Oregon Judicial Department returned to the Joint Ways and Means Public Safety Subcommittee to provide additional information on two projects: (1) court facilities and (2) additional funding for Oregon eCourt. The court-facilities presentation focused on the courthouse replacements and improvements completed during the 2015–2017 biennium as well as the expected efforts for the 2017–2019 biennium. A complete list of possible court-facility funding requests can be found in the Chief Justice Report on Potential Courthouse Replacement Funding Requests submitted to the Legislature’s Emergency Board in October of 2016. Below is a list of possible projects for the 2017–2019 biennium. The discussion of Oregon eCourt funding on April 25th focused on possible plans to make up for the expected funding shortfall of approximately $8 million for the 2017–2019 biennium. Currently, approximately 60 percent of the subscribers of the Oregon Judicial Case Information Network (OJCIN)—which includes Oregon eCourt and the file and serve system—are public, nonpaying members. Public members include the Department of Justice, Public Defense Providers, law enforcement, and the Department of Human Services. The remaining 40 percent of subscribers, such as attorneys and law firms, media, and title companies, are considered private subscribers and pay a one-time registration fee and subsequent monthly fees to receive access to documents. Funding sources currently being discussed include a 5-percent increase in filing fees, a $5 increase in criminal fines and assessments, an increase in OJCIN user fees, and a state agency assessment on the public subscribers. On April 18th, the Legislature hit its first scheduling deadline of the 2017 session. Unless a bill was in the Rules, Revenue, or one of the Joint Committees, the bill must have passed out of committee in its chamber of origin by April 18th. This session, a number of bills that the Bar is tracking passed out of committee before the deadline and are on their way to the second chamber. The next chamber deadline for moving a bill out of committee is June 2nd. Below are some of the bills that the Bar and its sections have been following over the last few weeks. HB 2101: Sunsets certain exemptions from disclosure for public records. SB 106: Creates Public Records Advocate and Public Records Advisory Council. SB 481: Establishes state policy regarding public access to public records. SB 496: Directs presiding judges of judicial districts within the state to ensure that proceedings before a grand jury are recorded. SB 505: Directs district attorneys to ensure that proceedings before a grand jury are recorded. HB 5013: 2017–2019 Oregon Judicial Department Budget. HB 5033: 2017–2019 Public Defense Services Commission Budget. SB 5535: 2017–2019 Oregon Department of Revenue Budget. HB 2605: Increases the number of circuit-court judges in several judicial districts. HB 2636/SB 11: Modifies annual salaries of judges of the Supreme Court, Court of Appeals, Oregon Tax Court, and circuit courts. HB 2345: Extends sunset on provision authorizing Department of Human Services to appear as a party in juvenile-court proceedings without appearance of Attorney General. SB 525: Extends sunset on provision authorizing Department of Human Services to appear as a party in juvenile-court proceedings without appearance of Attorney General. HB 2191: Requires a person to obtain or renew license from the Secretary of State in order to serve as a commercial registered agent in this state (Business Law Section). HB 2356: Establishes requirements under which a debt buyer may bring legal action to collect a debt (Debtor-Creditor and Consumer Law Sections). HB 2793: Requires a person convicted of commercial sexual solicitation to disclose to the court all Oregon licenses, certificates, permits, and registrations that the person holds (Administrative Law Section). SB 131: Modifies provisions relating to telephonic testimony in certain proceedings. SB 722: Provides that debt management service provider may charge a fee of not more than $100 for service in which the debt management service provider improves or preserves, or offers to improve or preserve, a consumer’s credit record, credit history, or credit rating but does not conduct a budget analysis for the consumer, act as broker for another debt management service provider, or otherwise engage in other activity that constitutes debt management service. SB 898: Establishes Task Force on Custody and Parenting Time (Family Law Section). SB 931: Provides that the court has discretion over the selection of alternate jurors and when alternate jurors are informed of alternate status. This is a partial list of bills that the Bar is currently tracking. If you have questions about a specific bill, please contact the Public Affairs Department at [email protected]. On April 12, 2017, Governor Kate Brown announced that she is accepting applications for two openings on the Oregon Court of Appeals. The first vacancy was occasioned by the appointment of Justice Meagan A. Flynn to the Oregon Supreme Court, effective April 4, 2017. The second vacancy will be occasioned by the retirement of Judge Timothy J. Sercombe, which will become effective July 1, 2017. The submission deadline has been extended from May 3, 2017 to May 5, 2017. Details available here.